Building own subwoofer is a funny and crazy job for DIY enthusiasts. It is a great way to get the subwoofer precisely what you want by spending a little amount of money. So, all you need for building home subwoofer are some necessary tools, materials, and hardware. We have explained the steps in an easy way. But it's the bitter truth that DIY job is not for everyone. However, we can ensure that if you follow the following steps accurately, you’ll get the perfect subwoofer. If you have limited space, an enclosure size will be perfect for you. However, the box volume will determine which enclosures you need for the best performance. Anyway, as the manufacturers recommend 10-inch box for small space, we will build a 10-inch DIY home subwoofer of 0.6 to 1.25 cubic feet volume. When you measure the depth of the box, add at least 2-inch which is required for attached several parts. The depth is the front-to-back dimension which is used for mounting the woofer box. Then measure the minimum height and width for the box. You may need additional space if you want to mount a grille. Once you measure the depth, height, and width, now it's time to determine the available space in your vehicle. Your vehicle must have sufficient space where the box can fit well. It would be better if you sketched the box according to the available space before cutting the fiberboard. Once you finalize the volume of the box, now compare it to the available space. It may be too large or too small to fit the space, don’t get anxious. You can still make adjustments so that the volume can match to the recommended specifications. Getting a high-quality performance and fidelity from the subwoofer is necessary. Now follow the below steps to construct your home subwoofer. After measuring and sketching the subwoofer box, now it’s time to cut the main fiberboard into pieces for back, front and top of the box by the table saw. What the table saw with a carbide-tipped blade cuts the fiberboard sharply and smoothly. However, if you use a circular saw to cut the fiberboard, be careful to keep the cuts in the square. You need seven pieces of the cuts- one for the back, two for top and bottom, two for the front and two for the sides. After cutting the pieces, you need to use a template to mark the pieces. It helps you to find the pieces for which side it is cut. Unless you mark the pieces, you may forget the sizes of the pieces. If it is possible, always use a double-thickness of MDF for the front panel. As the front panel has to bear much pressure, the double-thickness will make it extremely strong and non-resonant. Also, you can make a double-thickness sheet by adding two identical front pieces using carpenter’s glue and metal screws. However, if you don’t use a double-thickness of MDF, you must need to use bracing in the box to strengthen it. In fact, if your box is larger than the cubic foot, a bracing can meet the required strength. As the box is subjected to extreme pressure, a 2-inch by 2-inch lumber strips will add the bracing. So, screw and screw the bracing along two internal seams before attaching the top and the bottom. After completing the previous step, use a drill machine to make a hole near the inside edge of the circle. The hole should be large enough to fit in the jigsaw blade. If you don’t have a jigsaw, use a handheld saw to make the circular hole. Once the hole is made, the woofer opening is complete. After that, follow the previous procedure to make a rectangular hole at the back panel of the box. The hole will be used to hold the terminal cup. After marking the terminal cup with the silicon caulk, tighten the hole with 1/2 –inch sheet metal screws. As the front and the back panels are completed, now tie them everything. The sides of the box would be fastened with the front and the back first. Then the panels should be fastened with the top and the bottom. Remember that, the largest sides will provide much strength if they overlap each other of the smaller sides. As the MDF parts are prone to splitting, you should drill them earlier so that you can fasten them quickly and efficiently. After pre-drilling, use plenty of glues between the pieces. The glue will seal the box perfectly. So, if the box is poured, it won’t be wasted. Once the box is ready, drop the subwoofer in it and make sure that the subwoofer fits well. If the box seems a little bit large and the subwoofer seems loose, use coarse sandpaper to tighten it. When the subwoofer fits in place, use a steel caulk to mark the screw hole’ locations. Now, remove the subwoofer box and pre-drilled holes for easy mounting. When everything is fastened and sealed correctly, you have to wait for some time to dry the glue. After 12-14 hours, put the subwoofer back into the box. After curing the caulk, put the speaker wires from the terminal cup to the subwoofer. Use rope caulk to place the subwoofer back to the box and seal it. After drying the glue and the caulk, the box is ready to be used. Now connect the subwoofer with the amplifier by using 12-gauge speaker cables. Connect the jack to your audio device, hope it sounds well. Making anything at home symbolizes your quality and eagerness to learn anything. 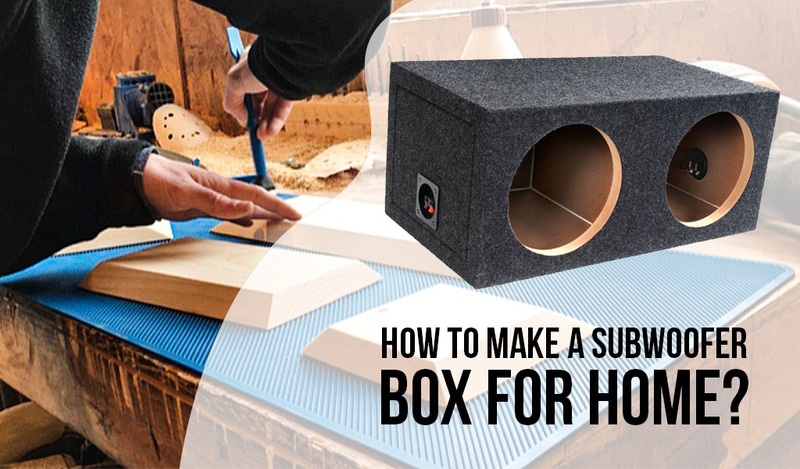 Hence, learning how to build a subwoofer box for the home will help you to customize your audio device. You can now fit the box anywhere you want. In fact, you can enhance the fidelity and sound quality of the speaker. This blog was very helpful for us. I have liked it very much. We wish to get blogs like this one everyday. Thank you sir.